Colour fundus photograph shows multiple cotton-wool spots surrounding the optic nerve, microangiopathy inferior and superior to the optic nerve and 2 small microaneurysms inferior to the fovea. A 54-year-old Caucasian female was referred by her optometrist with multiple white lesions around her right optic nerve. She had presented for a routine annual ophthalmic examination and was asymptomatic. Past medical history included a prosthetic left eye secondary to old trauma, nasopharyngeal carcinoma and cholecystectomy. There was no other ocular surgery or family history of ocular disease. On examination the visual acuity in the right eye (OD) was 6/6 with reading vision of N5. The intraocular pressure was 15mmHg. The anterior segment was normal with clear cornea and lens and a deep, quiet anterior chamber. The iris was round and dilated well, with no transillumination defects or posterior synechiae. There was no iris or angle neovascularization on gonioscopy. The vitreous was clear and the posterior hyaloid was still attached. Fundus examination revealed multiple cotton-wool spots surrounding the optic nerve, microangiopathy inferior and superior to the optic nerve and 2 small microaneurysms inferior to the fovea (Figure 1). No hard exudates, haemorrhages or retinal neovascularisation were noted. Peripheral retinal examination was unremarkable other than decreased pigmentation inferiorly, allowing for visualisation of choroidal vessels. The optic disc and retinal vessels were normal. 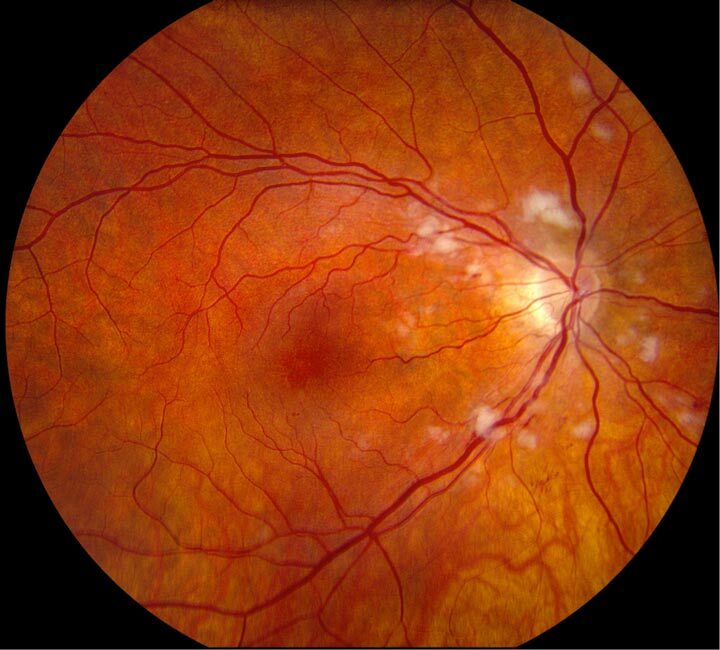 The differential diagnosis of retinal microangiopathy and cotton wool spots includes: diabetic retinopathy, retinal vein occlusion, hypertensive retinopathy, radiation retinopathy, systemic lupus erythematosus, interferon therapy and post chemotherapy. On further questioning, the patient revealed that she had her nasopharyngeal carcinoma treated with local radiation 12 years prior. The cancer had regressed with no recurrence or metastases. Fluorescein angiography demonstrated parafoveal microangiopathy with areas of retinal ischaemia surrounding the optic nerve (Figure 2). In the late angiographic frames, there was mild hyperfluorescent leakage at the fovea and staining of retinal vessels. No retinal neovascularisation was seen. Optical coherence tomography (OCT) scan of the optic nerve and macula were normal. Systemic investigation including blood pressure review, full blood count, blood sugar level, anti-nuclear antibodies, ENA, serum ACE and syphilis serology were all normal. Fundus fluorescein angiography of the right eye. There is microangiography around the optic nerve and fovea best seen in the early frames. Areas of retinal ischaemia surround the optic nerve. In the late angiographic frame, there is mild hyperfluorescent leakage at the fovea and staining of retinal vessels. No retinal neovascularisation is seen. The history, signs and imaging results are consistent with radiation retinopathy. The patient was observed and followed-up for signs of proliferative disease. Radiation retinopathy is an occlusive microangiopathy occurring after ionising radiation therapy that preferentially results in loss of vascular endothelial cells with relative sparing of pericytes.1 It develops slowly and can occur within months or even up to 15 years post radiation exposure. The condition was first described by Stallard and associates2 in 1933, in patients treated with radon seeds for retinal tumours. Retinal inflammation, exudation, haemorrhage and optic disc swelling were noted. The severity of radiation retinopathy depends on the radiation dosage, daily fraction size, radiation interval and area of irradiated retina.6 Tumours of the nasopharynx, paranasal sinus and orbit treated with external beam irradiation are more likely to develop radiation retinopathy as it is difficult to shield the eye from the radiation. Coexistent diabetes, hypertension, pregnancy, collagen vascular disease and simultaneous chemotherapy increase the risk of radiation retinopathy. Retinal argon laser photocoagulation to areas of ischaemic retina if retinal, iris or angle neovascularisation has developed. Intravitreal anti-vascular endothelial growth factor agents (bevacizumab) and/or steroids for macular oedema or proliferative disease. Vitrectomy surgery for vitreous haemorrhage or traction retinal detachment. The prognosis of mild non-proliferative radiation retinopathy is good and may remain stable for many years. However, vision loss from ischaemic maculopathy, traction macular detachment and neovascular glaucoma are usually irreversible. Appropriate ocular shielding and dosing of radiation is important to minimise vision loss from radiation retinopathy. Radiation retinopathy is an uncommon condition that can occur months to years following ionising radiation to the eye or surrounding tissues. The assessment and management is similar to diabetic retinopathy. The differential diagnosis includes diabetic retinopathy, retinal vein occlusion, hypertensive retinopathy, systemic lupus erythematosus, interferon therapy and post chemotherapy. 1. Archer DB, Amoaku WM, Gardiner TA. Radiation retinopathy-clinical, histopathological, ultrastructural and experimental correlations. Eye. 1991;5 ( Pt 2):239-251. 2. Stallard HB. Radiant energy as (a) a pathogenic and (b) a therapeutic agent in ophthalmic disorders. Br J Ophthalmol. 1933;1:1–79. 3. Maguire AM, and Schachat AP. Radiation retinopathy. In Retina Vol 2, Ed: Ryan S. St. Louis. Mosby Co 1994, 1509-1514. 4. Mukai S, Guyer DR, and Gragoudas ES. Radiation retinopathy. In Principles and Practice of Ophthalmology Vol II. Eds: Albert D, and Jakobiec F. Philadelphia:WB Saunders 1994, 1038-1041. Stanford MR. Retinopathy after irradiation and hyperbaric oxygen. J R Soc Med 77:1041-1043, 1984. 5. Yanoff M, Duker JS, Augsburger JJ. In Ophthalmology. 2nd ed. St. Louis, MO: Mosby; 2004. 6. Monroe AT, Bhandare N, Morris CG, Mendenhall WM. Preventing radiation retinopathy with hyperfractionation. Int J Radiat Oncol Biol Phys. Mar 1 2005;61(3):856-864.